I can honestly think of nothing meaningful to say about September so I won’t say anything! 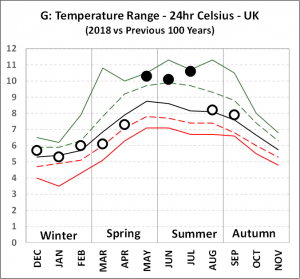 I will however introduce this new chart G which is for the Temperature Range. 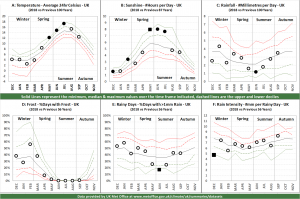 The Met Office tracks daily highs and daily lows for temperature and from that, they calculate the average high temperature and the average low temperature for each month. By taking the difference between these two numbers I get this chart. This adds some interesting context to our hot summer this year. The high temperatures on average were also accompanied by large variations between day and night. This is something I noticed myself in that whilst it was very hot during the day, the nights were not as uncomfortable as other years and that was because the minimum temperatures whilst high were not exceptional.